Princess Bloom is a character from Winx Club. She is the show's main protagonist and is the informal leader of the Winx, as well as the Princess of Domino and the keeper of the Dragon Flame. 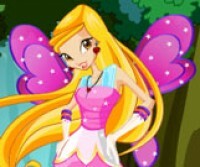 You can dress up Winx club fairy girl bloom with winx style clothes by playing this cool winx club Bloom stle game.